Cool conditions during planting season increase the potential for herbicide injury to seedlings due to slow emergence and reduced ability of the crop to metabolize herbicides. While herbicides may be responsible for emergence issues, most problems that have been brought to our attention seem to be primarily due to the environmental conditions rather than the herbicide. A symptom associated with Group 15 herbicides is improper unfurling of leaves as corn emerges. This injury is less frequent now than in the past since many of these products now include safeners, plus the availability of effective postmergence herbicides has resulted in many growers reducing rates. 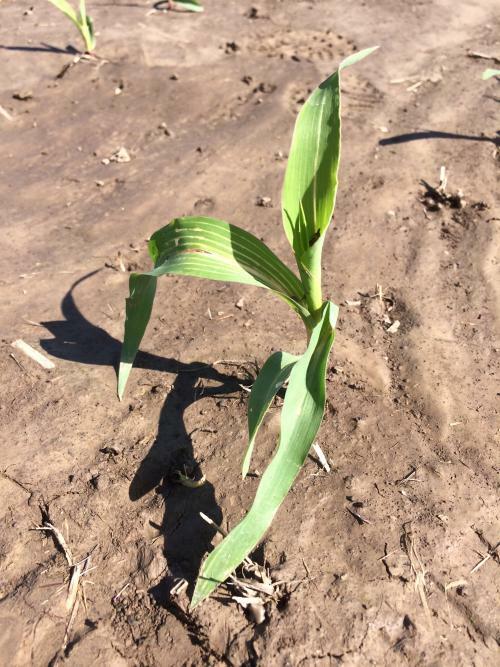 Improper unfurling of corn leaves has been attributed to other phenomena as well, including cloddy soils, compaction or soil crusting, cool and wet soils, and wide fluctuations in soil temperatures. 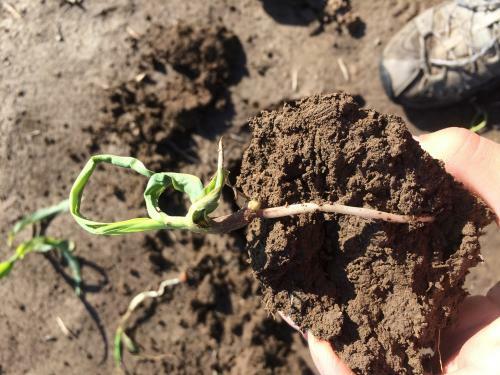 A field in southeast Iowa exhibited symptoms of improper unfurling of leaves on corn plants; the injury had no apparent pattern, affecting plants at random and accounting for about 5-10% of the total stand. Some plants were twisted or corkscrewed underground, while others were buggy whipped at the soil surface (Figure 1 and 2). This field was planted on April 24 and sprayed with 2.8 qt per acre of Harness Xtra 5.6L on April 28. Following planting, nighttime low temperatures remained cool until early May, but daytime temperatures reached highs in the 70s or 80s. Planting depth varied quite widely across the field, with some seed planted more than 2.5 inches in the ground and others less than 1 inch depth. Prior to noticing symptoms, the farmer also rotary hoed this field as is his standard practice in the spring; this resulted in some emerged seedlings being reburied in the soil. Figure 1. Buggy-whipping of corn can be caused by Group 15 herbicides, environmental conditions, or a combination of the factors. Figure 2. Emergence problem attributed to environmental stress. Abnormal growth often is caused by a combination of stresses, and in many cases it is difficult, if not impossible, to identify which factor is the primary culprit. While we cannot rule out the possibility that the herbicide played a role in the issue in this field, we suspect the environment and management practices were the leading factors involved in the emergence problems. An additional stressor in this particular field was the presence of fomesafen (Flexstar et al.) carryover injury. Fomesafen causes veinal necrosis on leaves, and the damage to the midvein often causes early leaves to ‘collapse’ (Figure 3). These symptoms were only evident at the entry of the field, indicating that the carryover likely was due to overapplication in this part of the field. 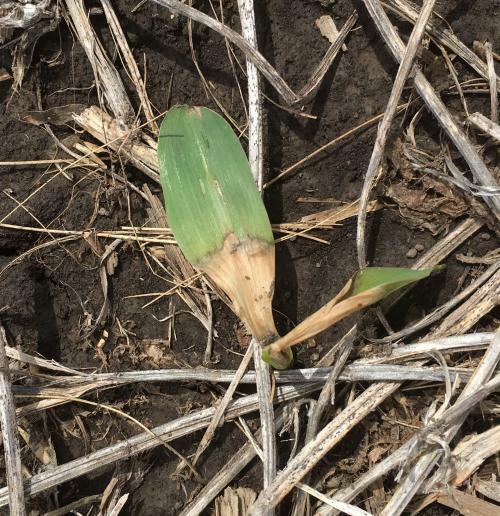 Due to the lack of fomesfen symptoms in other areas of the field, we don’t think it contributed to the improper unfurling seen throughout the field. Figure 3. Veinal necrosis typical of fomesafen carryover. There have been numerous reports of fomesafen injury to corn recently. Since fomesafen degrades more quickly with wetter soil conditions, some injury following last summer’s dry weather is not surprising in spray overlap areas or where a heavier rate was applied. Past experience suggests the corn will rapidly grow through this injury, but there always are exceptions. The increased use of ‘rescue’ treatments made into July to control waterhemp is the primary factor leading to these problems. There is a 10 month rotation restriction for corn following fomesafen use, so the product shouldn’t be used during July in most situations. The inclusion of residual herbicides (group 15 products) with early-postemergence application and/or planting narrow-row soybeans are the simplest strategies to limit the need for rescue treatments. 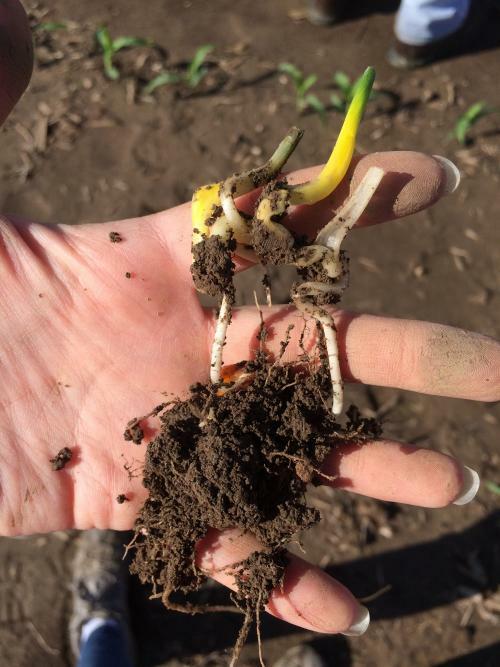 Corn in a field in southwest Iowa emerged normally, but then began to rot from within the whorl following a heavy rain (Figure 4). The damage was spotty throughout the field, but where present 5 to 10% of plants were affected. Since no herbicides had been applied yet (not a recommended practice), there were questions whether the rain could have splashed residues from the previous year’s product into the whorl. Based on the herbicides used during 2017 it was easy to rule this out. Nearly all of the dying plants had significant quantities of soil inside the whorl. The likely cause of death was the soil causing physical damage or transporting harmful microorganisms into the whorl. Figure 4. Heavy rain can wash soil into the whorl, resulting in bacterial infections. The majority of preemergence herbicides achieve selectivity based on differential metabolism – the crop detoxifies the herbicide more quickly than sensitive weeds. Any situation (shallow planting, heavy rain, misapplication) that increases the amount of herbicide in contact with the seed while it imbibes water increases the likelihood of injury. Cool or fluctuating temperatures can also reduce the crop’s ability to metabolize the herbicide. There are always risks when using herbicides, but the advantages they provide in managing weeds greatly outweigh these risks.